Let me start off by saying yes, yes it is true. I admit it. I love country music and, in MHO, there is nothing better than a well-written, traditional country song. 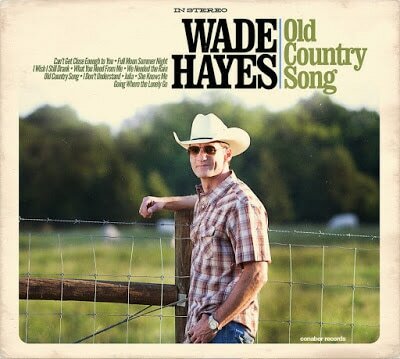 So when a copy of Wade Hayes' new album landed on my desk, well, as a reviewer, I was a happy camper. And when I saw the title of the album, suffice it to say, it was icing on an already delicious cake and I couldn't wait to dig in. There's a certain warmth and familiarity in an Old Country Song, the kind that sets your life to music, and delivers the words in such a way that even the most tragic storyline feels palatable. You recognize yourself, or someone you love, as you absorb the musical ambiance and enjoy the rhythmic way it makes your heart beat. Hayes says he feels this song is "brilliant" and I certainly agree. Roger Springer joined forces with Tim Menzies to write the title cut and they also wrote: "I Don't Understand (All I Know About Love)". This wasn't an easy album to review because I found myself writing too much. Most of the time when I'm reviewing an album, there will be a couple of tracks that stand out and they are what I write about, but there was much to like on this album. Seriously, every track was a standout so I felt compelled to mention as many of the song titles and songwriters as I could without rambling on, and the musicianship was excellent on every track. Quite simply put, I guess that means Hayes is as perfect at producing an album as he is every other facet of his craft/art. Megan Mullins joins Hayes on "What You Need From Me", written by Jon Randall and Jessi Alexander. Their voices compliment each other beautifully. In his notes, he says, "This is a song I came across years ago when I was trying to get my friend Megan Mullins another deal of her own. She’s one of the most talented people I’ve ever met. The people we met with played us the song and ask us to work it up for them. I fell in love with the song years ago and finally got the chance to record it with Megan." I'm glad, and I'm sure all of his fans will be glad he recorded it too. "I Wish I Still Drank" is a song he wrote after a friend told him about something he had done in his younger days. "It was one of the funniest true stories I’d ever heard," he said, "so I knew I had to write a song around it. Lee Roy Parnell was actually there when it happened, so naturally, I had to have him play the slide solo on the album and he killed it." Parnell was awesome, but so was Hayes. It's one of those happy/crazy/no reason nor rhyme songs that just makes you feel like having a party. John Jarvis and Wade's first producer, Don Cook, wrote the Conway Twitty hit "Julia". The Merle Haggard/Dean Holloway tune, "Going Where the Lonely Go," rounds out the album. Hayes hits them both out of the park! Truthfully, I think I hit replay about ten times and Merle was probably smiling up in heaven. Oh, and the guitar playing was off the chain! The caliber of writers and musicians on this album speaks to the talent quotient and integrity of this artist. Bravo! BTW, the eleventh track - yes, I know it only lists ten songs on the album cover but there are eleven. What we call "a hidden or bonus track", on this album it turns out to be a beautiful hymn titled, "In Christ Alone". According to his good friend, Helen Neal, this is not the first time he has put a hidden track on one of his albums. This particular hymn was one he had not heard until he started going to his current church and it is now one of his favorite hymns. She says he used two different guitars on it. For the classical part, he used a guitar like Willie's. All I can say is that it was a simply splendid way to end an Old Country Song.